Great businesses succeed by motivating people with the straight facts. There are four ways to get the truth out there. 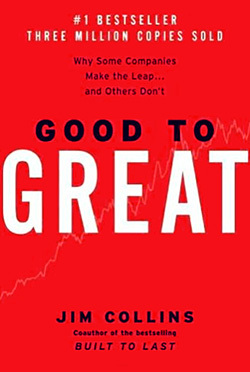 We conclude our Leadership Hall of Fame series, a year-long look at the top business books and authors, with an excerpt from Good to Great (2001) by Jim Collins. Now, you might be wondering, “How do you motivate people with brutal facts? Doesn’t motivation flow chiefly from a compelling vision?” The answer, surprisingly, is “No.” Not because vision is unimportant, but because expending energy trying to motivate people is largely a waste of time. One of the dominant themes that runs throughout this book is that if you successfully implement its findings, you will not need to spend time and energy “motivating” people. If you have the right people on the bus, they will be self-motivated. The real question then becomes: How do you manage in such a way as not to de-motivate people? And one of the single most de-motivating actions you can take is to hold out false hopes, soon to be swept away be events. 1. Lead with questions, not answers. In 1973, one year after he assumed CEO responsibility from his father, Alan Wurtzel’s company stood at the brink of bankruptcy, dangerously close to violation of its loan agreements. At the time, the company (then named Wards, not to be confused with Montgomery Ward) was a hodgepodge of appliance and hi-fi stores with no unifying concept. Over the next ten years, Wurtzel and his team not only turned the company around, but also created the Circuit City concept and laid the foundations for a stunning record of results, beating the market twenty-two times from its transition date in 1982 to January 1, 2000. When Alan Wurtzel started the long traverse from near bankruptcy to these stellar results, he began with a remarkable answer to the question of where to take the company: I don’t know. Unlike leaders such as Roy Ash of Addressograph, Wurtzel resisted the urge to walk in with “the answer.” Instead, once he put the right people on the bus, he began not with answers, but with questions. “Alan was a real spark,” said a board member. “He had an ability to ask questions that were just marvelous. We had some wonderful debates in the boardroom. It was never just a dog and pony show, where you would just listen and then to lunch.” Indeed, Wurtzel stands as one of the few CEOs in a large corporation who put more questions to his board members than they put to him. The good-to-great leaders made particularly good use of informal meetings where they’d meet with groups of managers and employees with no script, agenda, or set of action items to discuss. Instead, they would start with questions like: “So, what’s on your mind?” “Can you tell me about that?” “Can you help me understand?” “What should we be worried about?” These non-agenda meetings became a forum where current realities tended to bubble to the surface. 2. Engage in dialogue and debate, not coercion. In 1965, you could hardly find a company more awful than Nucor. It had only one division that made money. Everything else drained cash. It had no culture to be proud of. It had not consistent direction. It was on the verge of bankruptcy. At the time, Nucor was officially known as the Nuclear Corporation of America, reflecting its orientation to nuclear energy products, including the Scintillation Probe (yes, they really named it that), used for radiation measurement. It had acquired a series of unrelated businesses in such arenas as semiconductor supplies, rare earth materials, electrostatic office copiers, and roof joists. At the start of its transformation in 1965, Nucor did not manufacture one ounce of steel. Nor did it make a penny of profit. Thirty years later, Nucor stood as the fourth-largest steelmaker in the world and by 1999 made greater annual profits than any other American steel company. How did Nucor transition from the utterly awful Nuclear Corporation of America into perhaps the best steel company in America? First, Nucor benefited from the emergence of a Level 5 leader, Ken Iverson, promoted to CEO from general manager of the joist division. Second, Iverson got the right people on the bus, building a remarkable team of people like Sam Siegel (described by one of his colleagues as “the best money manager in the world, a magician”) and David Aycock, an operations genius. 3. Conduct autopsies, without blame. In 1978, Philip Morris acquired the Seven-Up company, only to sell it eight years later at a loss. The financial loss was relatively small compared to Philip Morris’s total assets, but it was a highly visible black eye that consumed thousands of hours of precious management time. In our interviews with the Philip Morris executives, we were struck by how they all brought up the debacle on their own and discussed it openly. Instead of hiding their big, ugly mistake, they seemed to feel an almost therapeutic need to talk about it. In his book, I’m a Lucky Guy, Joe Cullman dedicates five pages to dissecting the 7UP disaster. He doesn’t hold back the embarrassing truth about how flawed the decision was. It is a five-page clinical analysis of the mistake, its implications, and its lessons. Hundreds, if not thousands, of people hours had been spent in autopsies of the 7UP case. Yet, as much as they talked about this conspicuous failure, no one pointed fingers to single out blame. There is only one exception to this pattern: Joe Cullman, standing in front of the mirror, pointing the finger right at himself. “[It]…became apparent that this was another Joe Cullman plan that didn’t work,” he writes. He goes even further, implying that if he’d only listened better to the people who challenged his idea at the time, the disaster might have been averted. He goes out of his way to give credit to those who were right in retrospect, naming those specific individuals who were more prescient than himself. 4. Build “red flag” mechanisms. We live in an information age, when those with more and better information supposedly have an advantage. If you look across the rise and fall of organizations, however, you will rarely find companies stumbling because they lacked information. Bethlehem Steel executives had known for years about the threat of mini-mill companies like Nucor. they paid little attention until they woke up one day to discover large chunks of market share taken away. Upjohn had plenty of information that indicated some of its forthcoming products would fail to deliver anticipated results or, worse, had potentially serious side effects. yet it often ignored those problems. With Halcion, for example, an insider was quoted in Newsweek saying, “dismissing safety concerns about Halcion had become virtual company policy.” In another case when Upjohn found itself under fire, it framed its problems as “adverse publicity,” rather than confronting the truth of its own shortcomings. Executives at Bank of America had plenty of information about the realities of deregulation, yet they failed to confront the one big implication of those realities: In a deregulated world, banking would be a commodity, and the old perks and genteel traditions of banking would be gone forever. Not until it had lost $1.8 billion did Bank of America fully accept this fact. In contrast, Carl Reichardt of Wells Fargo, called the ultimate realist by his predecessor, hit the brutal facts of deregulation head-on. Sorry, fellow bankers, but we can preserve the banker class no more. We’ve got to be businessmen with as much attention to costs and effectiveness as McDonald’s. With the red flag, I had no idea precisely what should happen each day in class. In one situation, a student used her red flag to state, “Professor Collins, I think you are doing a particularly ineffective job of running class today. You are leading too much with your questions and stifling our independent thinking. Let us think for ourselves.” The red flag confronted me with the brutal fact that my own questioning style stood in the way of people’s learning. A student survey at the end of the quarter would have given me that same information. But the red flag–real time, in front of everyone in the classroom–turned information about he shortcomings of the class into information that I absolutely could not ignore. To be clear, we did not generally find red flag mechanisms as vivid and dramatic as short pay in the good-to-great companies. Nonetheless, I’ve decided to include this idea here, at the urging of research assistant Lane Hornung. Hornung, who helped me systematically research and collate mechanisms across companies for a different research project, makes the compelling argument that if you’re a fully developed Level 5 leader, you might not need red flag mechanisms. But if you are not yet a Level 5 leader, or if you suffer the liability of charisma, red flag mechanisms give you a practical and useful tool for turning information into information that cannot be ignored and for creating a climate where the truth is heard. Excerpted from Good to Great: Why Some Companies Make the Leap … and Others Don’t by Jim Collins. Published by Collins Business. All rights reserved.